A group of psychologists at the University of Kent are making an impact on applied health research, finding innovative ways to involve the public through interactive activities on topics such as dementia, mindfulness and wellbeing. Dr Hamilton-West was part of a team led by Amanda Bates, CHSS Public Engagement Officer and a PhD student in applied psychology at the University of Kent, which put on a ‘Let’s Talk About Health Research’ event. Held in a community centre in Canterbury, the day also involved CHSS psychologists Sarah Hotham and David Lowery, as well as Nicola Enright, a service user who has long-standing links with CHSS, and Leah Thorn, a Leverhulme Trust Artist in Residence hosted within CHSS. 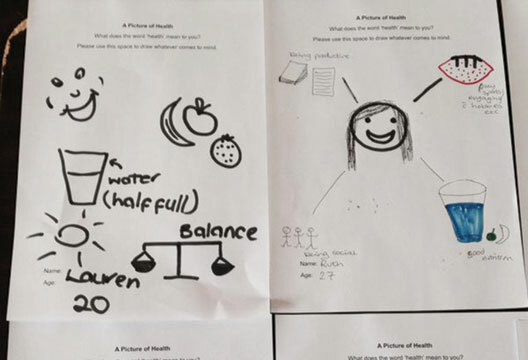 Interactive activities included screenings of Thorn’s film ‘Watch’, which explores the impact of dementia on a father/daughter relationship; a mindfulness eating exercise; and ‘Picture of Health’ (drawings by members of the public illustrating what ‘health’ means to them). Researchers discussed research relating to these themes, and delegates were encouraged to share their perceptions and experiences of health research.